Online Ordering is now available! Orders are shipped on Tuesdays via FedEx. Great as Gifts! 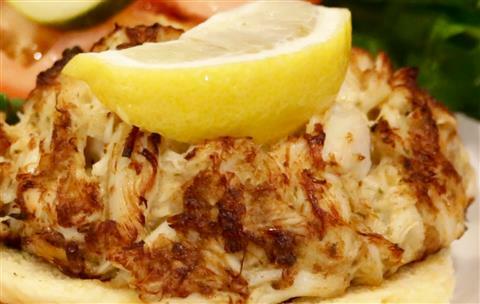 Crab Meat: Jumbo Lump & Lump Seasoning: Wheat Flour (Wheat and Barley Flour), Spices, Whey (Milk), Natural Flavor, Whole Egg Powder, Dextrose, Enriched Wheat Flour (Wheat Flour, Malted Barley Flour, Niacin, Reduced Iron, Thiamine, Mononitrate, Riboflavin, Folic Acid), Baking Powder (Sodium Acid Pyrophosphate, Sodium Bicarbonate, Corn Starch, Monocalcium Phosphate), Sea Salt, Yeast, Parsley, Celery Seed, Granulate Garlic, Citric Acid, Soybean Oil, Sugar, Caramel Color, Turmeric, Annatto and Paprika Extracts for color. ALLERGEN INFORMATION: This product contains egg, soy, wheat, and milk ingredients.